Would this also affect the composite video? I wouldn't think so, but I'm not an expert. As I said before, your composite video output is normal for a NESRGB install. The palette switches have to be wired a specific way to preserve composite video (and lose one palette), which I can see from your install it has not been. Hello! Just thought I'd come back to mention that the Triad worked like a charm, so happy to have finally solved this issue I need to say a big thanks to everyone that helped, especially FBX for the reccomendation. I think I figured out what the issue was, I have 2 NES's, a PAL frontloader and an AV Famicom. I thought the issue was that it didn't have enough amps so I bought a 2A PSU, but that didn't fix it. The PAL NES outputs 50Hz video, so with a 50Hz AC DC adapter any interference will show up in the video. Meanwhile the AV Famicom outputs 60Hz and so 50Hz power interference doesn't show up. So I think the problem was more interference than current. I'm sure Danexmurder had the same issue I had but with 60Hz. I'd like to provide an update/bump to my earlier question: so my modder can't get the NESRGB + component board to work on my Famicom AV still. When outputting YPbPr, the picture is WAY too blue. If we unplug the blue component cable, the problem goes away but of course the colors are now wrong. We are unable to test RGB output due to lack of cables. I e-mailed Tim for help and he said to hook it up just using composite. My modder went back and done this and it works fine - no blue problem. The palette switch is currently wired for garish/natural/improved though. Is the composite test actually correct in this case or should the palette be wired for improved/off/natural. Any ideas what could be causing the too much blue? 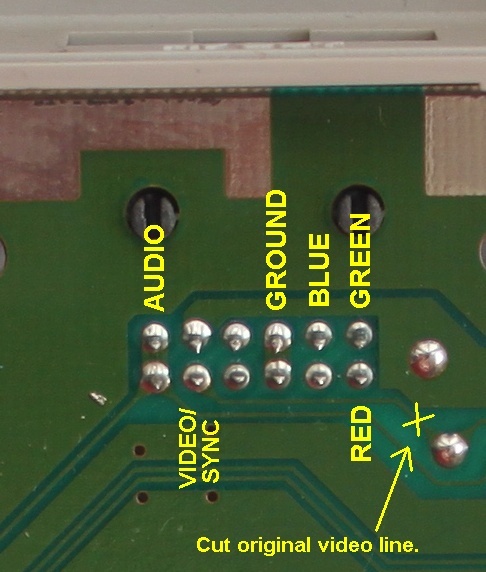 Looking closely at your pics, on the small Component Video add-on board is their a short between two of the pins on the chip? It could just be my eyes or the angle of the photo, but it looks like a small thin solder bridge. My RGBNES + Component video board problem in my earlier post has been resolved. If someone else ever comes across this problem where everything is soldered and wired correctly but getting weird color problems, check your 3.5mm -> 3x RCA adapter. That's what was causing the problem. My mod guy tells me there was continuity between the green and blue inside the cable. Once we took the adapter out of the equation, the picture was perfect! Hi again, after a few months of not using my AV Famicom I started using it again a few days ago. There's this really weird issue I'm experiencing where after a minute or 2 of being on, certain things on screen start to flicker. it's not like bad contacts (I cleaned my cart thoroughly with isopropyl alcohol, plus it's happening in loads of games) as it's not the entire screen becoming corrupted, rather one or two things on screen have random white or black pixels appear in them, although it seems to be specific things meaning it's not video interference. 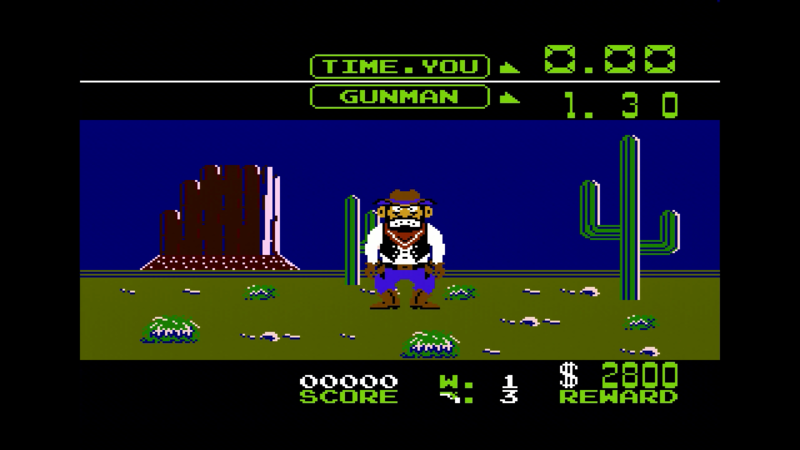 For example see the images of Wild Gunman below, it always happens in the rock mountain in the background. It's hard to show in images as only one or two pixels appear at once. In a video they rapidly flicker. There's a link to a google drive with some videos of it happening too. thought I'd ask here first, but I'll try the NESRGB thread next if I have no luck. Hi, I had the exact same issue with my AV Famicom... the fix is actually documented on this forum by Jason (Game-Tech.US) as it was his video I stumbled across on Youtube that lead me to the thread. Anyway it is to do with interference from the original composite output on the board even though the trace has been cut. If you remove Q1 (2SA937) it severs the connection completely and I have not seen it return since. Here is a post with a nice pic i followed viewtopic.php?p=1297501#p1297501 but the whole thread is probably worth a read. It seems to really show up when using an Everdrive rather than real carts i believe. Also out of interest how did you get those video captures? They are very clean and show the issue perfectly. I'm glad you think it looks good, I've been worried about bad compression as I haven't messed around with OBS much yet. No worries, let us know how you get on! If you want to watch Jason work through the issue he has a five parter about it on youtube... https://www.youtube.com/playlist?list=P ... 24ClLwmmfa Pt5 is where he eventually finds the fix! In regards to the captures... there is some compression in the video (you can see it in the red mountain in the background) but the image is still very clean overall. I am guessing you can adjust the amount of compression somewhere in the software though. I am yet to get into capture cards myself yet but probably will do in the not too distant future. Hey Flex, I've read through that entire thread and watched all 5 videos. I'll try the fix this weekend, interesting that it's the composite. I had an issue with video interference on my PAL NES, where it was like static on the screen. But this was more like a glitch, and the composite interference with the NESRGB makes sense. I had recently rewired my palette switch to allow composite out (just for reference) so maybe wiring composite to the multi out is what's caused this to appear now (even though I'm using csync). Plus as I've said, I did the dejitter mod, which has the board mounted underneath the NESRGB, putting the clock nearer the transistor. Do you know which trace to cut (or which PPU pin it's from)? Well if I remember correctly the built in composite from the AV Famicom goes to pin 9 on the Multi AV out and you are supposed to cut this trace as part of the standard NESRGB install. I assume you have done this or have you left it attached? I am personally using CSYNC from my NESRGB board to Pin 3 of the MultiAV out and normal composite (but from the NESRGB board instead) to Pin 9. Just to provide maxium compatibility, I even have Luma sync wired up to pin 7 so can use any cable! Even in this configuration I was still getting the same interference issue although I am using CYSNC and the original trace is cut (until I removed the transistor). Because of this I can only assume it is interference caused by traces on the board that run close to each other. Here is the pic from etim's guide. Yeah it's cut, I've got composite coming from the NESRGB (PPUV not the one generated by the NESRGB). As you've said you still had the issue until you removed the transistor, I'll try disconnecting PPUV from the multi out, and if I still have the issue remove the transistor. Will let you know how it goes. Flex, thank you so much. I tried just removing the wire between the NESRGB and the multiout, but that seemed to make it worse. Suddenly the whole screen was flickering with black and white dots. So I tried removing the transistor, took almost an hour (I don't have a desolderimg station, so I had to slowly wiggle it out with a soldering iron). I accidentally snapped off a capacitor as well, but as it was C5 people were saying it's fine to remove it anyway as it's useless once the transistor is removed. Then plugged it in and bam, no dots. So relieving. I can finally continue my NES playthrough (and stop bothering people on shmups). New version 2.0 NESRGB hardware is out. Ihis features built in de-jitter, no RGB output coupling capacitors (improves compatibility with Super Nintendo SCART cables), and a new set of palettes. I also made a de-jitter firmware version for previous NESRGB hardware, though it comes at the cost of the palette switch. More info here. Thats great news, thanks viletim I just have a few questions if you dont mind. -Are there any other changes on the NESRGB V2.0 besides those mentioned in your post? -Which palettes have been selected as the stock/default choices on the new firmware? and will firmware updates with different palette options still be possible/available in the future? -Is there any way to toggle the dejitter mode on and off, or is there really no reason to ever disable it? -I noticed the RGB signals now appear to pass through not just the BH7236AF video encoder, but also a new IC which I think is a THS7374, and it looks like only the THS7374 is connected to the standard RGB output pads. I was just curious what the reason was for this change? -I completely understand why the 220uF capacitors for RGB were removed (The capacitors are usually included inside the SCART plug on most standard/NTSC cables, and so they are usually bypassed on most NESRGB installs for this reason) However I can only see one remaining 220uF capacitor for composite video - is the other 220uF capacitor required for S-Video on the opposite side of the board? I realise S-Video isn't this boards primary purpose (and likely not many people use it) but I just like to wire up all the available video outputs if I can. Last edited by Link83 on Sun Feb 10, 2019 3:07 pm, edited 1 time in total. -Which palettes have been selected as the stock/default choices? and will firmware updates with different palette options still be possible/available in the future? I'll update the package of firmware that Firebrandx is hosting to V2 when I get a chance (maybe in a week or so). -Is there anyway to toggle the dejitter mode on and off, or is there really no reason to ever disable it? I don't know a good reason to disable it. If somebody complains I suppose I'll release a firmware with the feature disabled. -I noticed the RGB signals now appear to go through not only the BH7236AF video encoder, but also a new IC which I think is a THS7374, and it looks lie only the THS7374 is connected to the standard RGB output pads. I just wondered what was the reason was for the change? Yes THS7374, 4 channels Red, Green, Blue, Luma. I removed 4 capacitors (they cost money). -I completely understand why the 220uF capacitors for RGB were removed (The capacitors are usually included inside the SCART plug on most standard/NTSC cables, and so they are usually bypassed on most NESRGB installs for this reason) However I can only see one remaining 220uF capacitor for composite video - is the other 220uF capacitor required for S-Video on the opposite side of the board? I realise S-Video isn't this boards primary purpose, but I just like to wire up all the available video outputs if I can. S-video is still fine. It's the old fashioned video output drivers in the video encoder that need the coupling caps on the outputs. It's not something inherently required by s-video. Ah I see, so since Luma now goes through the THS7374 I guess a 220uF capacitor isn't really necessary anymore. I'm still curious about the switch to a THS7374 though, was it just a case of using a more modern video driver made sense? and have you tried comparing the THS7374 RGB output to the BH7236AF? I was just curious if there was any visable difference/improvement in the picture quality when compared to the NESRGB V1.X. 6. Isolate the PPU pin 18 (clock) from the NESRGB board. I recommend cutting the small part of the pin off so it no longer makes contact with the socket. I DO NOT recommend bending the pin away from the socket at that causes the pin to fatigue and possibly break off. Solder a wire between the isolated PPU pin 18 and palette pad 2. Also, perhaps you might want to update the thread title and first post so people know there's a new V2.0 revision available? Is there enough clearance in the socket to simply wrap the pin in a layer of kapton tape? Edit: NESRGB 2.0 is still compatible with the YPbPr component board, yes? Last edited by nmalinoski on Mon Feb 11, 2019 1:48 am, edited 1 time in total. Just got the 2.0 kit for an AV Famicom that I'm expecting, I actually decided to retire my RetroUSB AVS and am going back to original hardware, so this will go great with my OSSC. The main reason was to get rid of the coupling caps. The THS7374 is cheaper than the caps and their removal will reduce the amount of times I get questions about removing them to accommodate Nintendo SCART cables. The video quality is unaffected by the change. The filter in the THS7374 is disabled by default but you can enable it by closing solder jumper J9 if you like. No, the NESRGB needs to be in between the clock signal from the motherboard and the modified clock that goes to the PPU. It's not possible to make the separation on the NESRGB board that has already been installed because the twe pads are 2mm from each other and have a large socket or PPU soldered on top. You'd have a hard time inserting the pin without the tape falling off. The round pin sockets grip tightly. Given the socket is round, maybe drilling out pin 18 from the socket with a small drill bit would work. This would avoid damage to the PPU and still look reasonable neat. Yes. The changes shouldn't affect compatibility with any external boards (mine or others). I know it's only a couple of frames per hour difference but if you're a speedrunner competing for world records, this might matter. I've been installing a switch to disable it per marqs suggestion in the dejitter thread. Is there a firmware version for 1.x boards that contains the Firebrandx Smooth palette? Tim has promised to rebuild all those firmwares for the new board revision as well. Does the dejitter feature re-time the NES in any way? For example, how the Hi-Def NES or RetroAVS is technically behind 1 second compared to original hardware after 10 minutes? Or is this completely unrelated to that? I still use a Framemeister, so I don't need the de-jitter... but as I understand it, it will fix the left-offset first line of the first line of pixels? And it will give me more options if I go with the OSSC later on, yes? Correct. I don't think the NESRGB affects the clock speed like the HiDef NES. However, I'm wondering about the impact or differences with the dejitter mod + NESRGB (and the SNES). 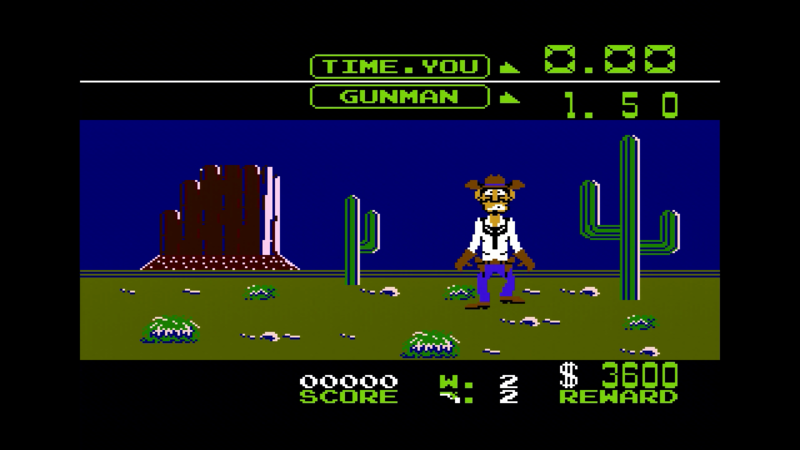 Gating of the clock affects speed but the difference is minimal - in 1 hour of gameplay a de-jittered system falls less than 2 frames behind a vanilla system. Small difference as it is, I still don't like the idea of playing on original hardware with altered speeds. If I didn't mind I would've gotten one of those HDMI solutions already. Ahhh thanks for that. Yes I'm with you.. minor as it is (2 frames an hour), I don't like the idea of altering the speed in any way. I think I'll choose b To each their own, of course, I just think it's a little silly to even think about it unless you are a speedrunner (and even then, emulators are allowed for NES in many communities and I'm sure those are at least as variable from one PC to the next). If I haven't miscalculated, 2 frames per hour is a difference of about 9 ppm (parts per million). A typical crystal as used in the NES to generate the main system clock (and thus regulating the system's speed) has a tolerance of +/-50 ppm at room temperature, meaning that the speed difference between two different unmodified NES control decks can be much larger than the speed difference introduced by the dejitter function.